PEPPERMINT IGUANA: SHAKE OF THOSE WINTER BLUES; Go to Sick Note party then phone in sick! 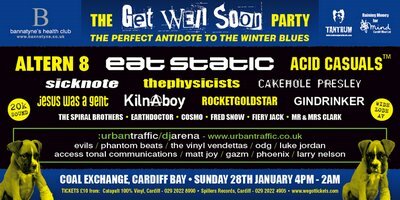 SHAKE OF THOSE WINTER BLUES; Go to Sick Note party then phone in sick! 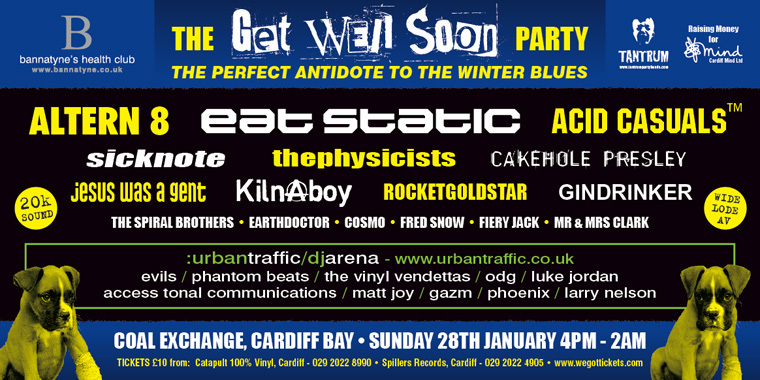 It’s only January, but this week sees what may well turn out to be the Welsh musical event of the year. This Sunday (28TH) sees an amazing line up of bands DJs and all-round entertainment geezers arriving for a 10 HOUR musical extravaganza in the Coal Exchange, Cardiff. The event features psy-trance/break beat/drum ‘n bass legends EAT STATIC; old-skool ravers ALTERN 8; local nu-skool ravers ACID CASUALS; the one and only, soon to be massive, post nu-rave disco sluts SICK NOTE; psycho garage punks THE PHYSICISTS; anarcho diddly punk core heroes KILNABOY and many more, all held together by compares like one man cult COSMO; and DJS such as the mighty EARTHDOCTOR. Miss it and regret it, it is going to be LEGEND! And if you are not up to going to work after raving till 2am on a Sunday, why not phone in sick and buy SICK NOTE’S new single PHONE IN SICK, which will be released on Monday to help you shake off the blues on what is scientifically proven to be the most depressing day of the year. Cant face going outdoors to buy it? No worries, download it from http://www.indiestore.com/sicknote … go on, get it to number one, it is about time there was something sick at the top of the charts. For more info go to tantrumpartyheads. bannatynes? bannatynes!?!! a new low.